When is a Collector's Edition too much? 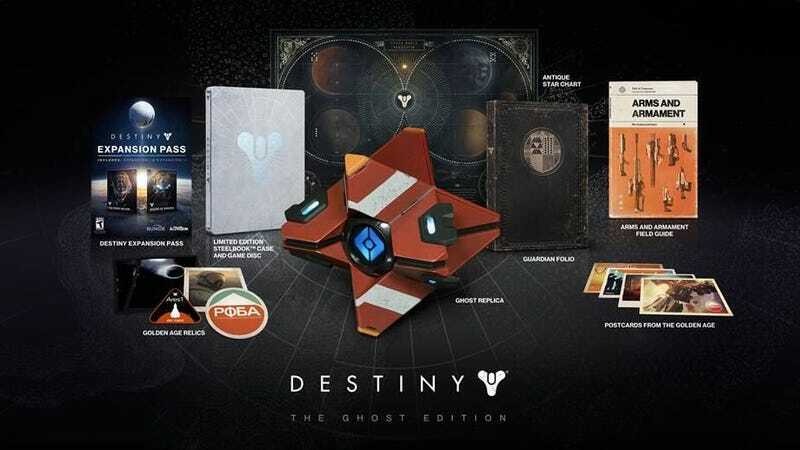 With the recent announcement of the $149.99 "Ghost Edition" of Destiny, I looked back at all of the collector's editions of titles and ask... why? Now I am incredibly excited about the release of Destiny, and would be lying if I said that I am not tempted to buy this version of the title, but there is a little voice in my head asking me do I need this, is it really necessary? I love getting collector's editions of games and looking at all of the cool goodies that they come with. I picked the limited editions of both Oblivion and Skyrim, as well as Fallout 3 and New Vegas. I have Infamous 2, Second Son, Killzone 3, Uncharted 3, and countless others displayed on my bookshelves, but they are now collecting dust. I have finally reached that point in my gaming career where I am thinking about it being a financially sound investment, instead of a cool item to sit on my desk in my office. $450 later and a 2 week wait, this was happily sitting on my shelf. But is it because of nearly every game coming out has a collector's edition? Sniper Elite 3, Far Cry 4, Assassin's Creed Unity, Order: 1886, Witcher 3, Dragon Age: Inquisition are just a few that I have found while looking up the new Destiny editions. A lot of these won't include anything more than a statue/figure, maybe some stickers, exclusive DLC, and a metal case. While awesome they may be, I enjoy the ones with extra thought into it. For instance, the Oblivion collectors edition came with a "Pocket guide to the Empire" which went a little more in depth with the different races, areas, and creatures in the game. These are the items I enjoy, the ones that let us take a deeper look into the universe itself. Out of everything, I bought this for the stupid book. That is the one thing that is making me consider purchasing this version of Destiny. All of the journals, the weapons guide, the player-folio, and yes... even the Ghost. All of these items bring us closer to the games universe, instead of having a statute of Nathan Drake(Uncharted 3), or a light up Plasma Cutter (Dead Space 2), but literature that explains more about the titles. Limited edition's aren't so limited anymore, and with more titles releasing them, it is hard to tell which ones you want to get. Edit - It looks like NewEgg has more pre-orders available for Ghost Edition. Check out other deals here.